Did you know that Spanish is the world’s second most commonly spoken language? 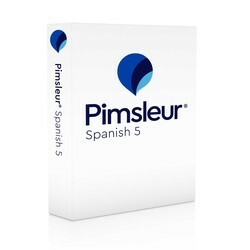 For Americans, it’s one of the easiest to learn, and you won’t find anything faster or easier than the Pimsleur® Method. Even knowing a little bit of Spanish will make travel to Latin America or Spanish-speaking countries a breeze. Whether you want to travel, communicate with friends or colleagues, reconnect with family, or just understand more of what’s going on in the world, learning Spanish will expand your horizons and immeasurably enrich your life. - Quick & Easy – Only 30 minutes a day. - Portable & Flexible – Core lessons can be done anytime, anywhere, and easily fit into your busy life. - 85 minutes of reading instruction in the form of a short story, allowing you to build your skills toward reading Spanish for pleasure. Building on skills taught in Spanish Levels 1-4, Spanish Level 5 moves you closer to near fluency, and adds a broad range of conversational skills. The pace and conversation move rapidly, accelerating exposure to new vocabulary and structures, and approaching native speed and comprehension. You’ll learn to speak more in depth about your personal life and experiences, and gain even more proficiency at creating complex sentences, and discussing events in the present, past, and future. You’ll learn to talk about hypothetical situations, and to relate what someone else has said. - Personal and daily life: expressing disappointment; dealing with voicemail; talking about hobbies, the weather and the seasons, sports and national teams, hypothetical situations; discussing retirement; admitting a mistake; expressing opinions and preferences. Of course, you'll not just need to speak Spanish; you’ll also need to be able to read it. Take your reading to a new level with a 75-minute story broken down into 20 manageable segments. This course teaches Latin American Spanish.